Enjoy private cabins, dining, a saloon, horseback riding, hunting, fishing, and event hosting at the edge of Yellowstone National Park in the beautiful and secluded upper South Fork Valley. 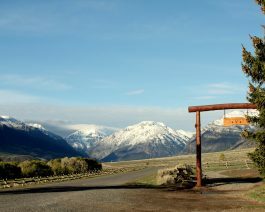 Open year-round, Double Diamond X Ranch is a premier destination for wilderness adventures, gatherings, and relaxation in Yellowstone Country’s most spectacular valley. Double Diamond X Ranch is off the beaten path, located on the upper South Fork of the Shoshone River where the road ends at the base of the 12,000 foot Absaroka Mountains. The ranch is adjacent to the Washakie Wilderness Area of Shoshone National Forest, which is contiguous with Yellowstone National Park, providing a backyard of 3 million of the wildest, most scenic acres in North America. Seclusion is balanced with the convenience of year-round accessibility, being only 35 paved miles from the vibrant Western town of Cody. Horseback riding, fishing the Shoshone River, pack trips , holiday parties, weddings, weekend getaways, or a world-class ice climbing experience are offered. No Pets.